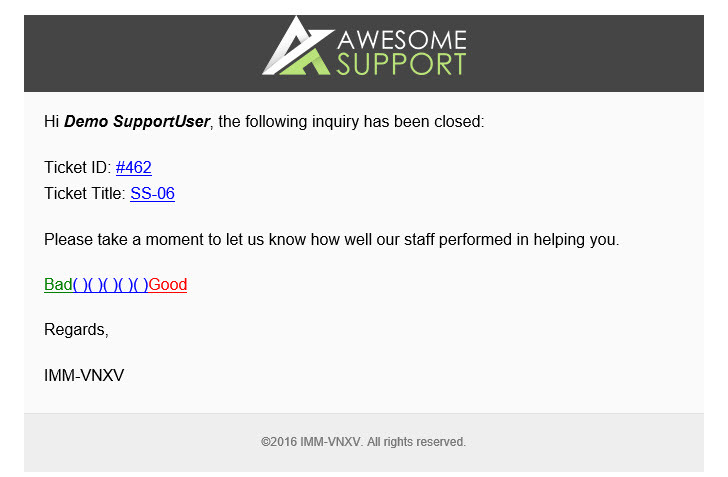 The Satisfaction Survey add-on enables you to automatically send a survey email to your customers after a ticket has been closed. The email will contain a link to a survey where the customer can indicate how satisfied they were with the efforts of the support agent to resolve their issue. Here is an example of what an email can look like – note that we have “prettied” up this email example to add a logo, a nice footer etc. The survey is kept as simple as possible – studies have proven that customers are more likely to complete a survey if the expected time investment is small. Sending an automatic email X minutes/days after a ticket is closed. The user will click a survey link and fill out the survey form on your website. Sending an automatic email X minutes/days after a ticket is closed that includes only TWO options – a “thumbs up” or “thumbs down” (good/bad). As soon as the user clicks an option in the survey email the choice will be recorded and they will be shown a “thank you” message. View an automatic survey page after the user closes a ticket. Include a survey link on each email that a customer receives from an agent about the ticket. You need to ensure that your WordPress Cron system is working properly. That your site is receiving enough traffic to trigger WordPress’ Cron system at the appropriate time. Your site should be getting at least one visitor every hour in order to trigger the WordPress Cron system.